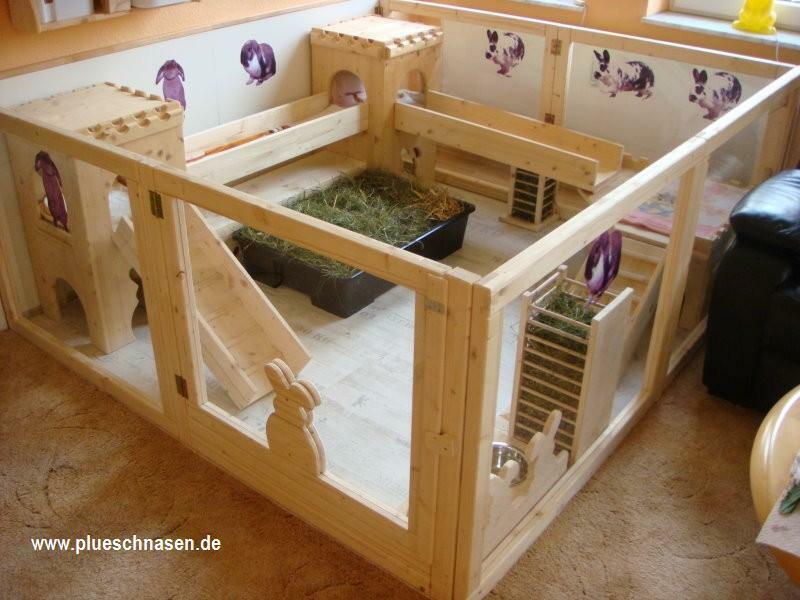 A rabbit's home should be big enough to hold a litter box, hay, water and food bowls and room to stretch out or play. It should include bunny-safe chew toys to keep him or her occupied. 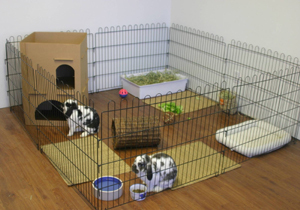 All rabbits need daily exercise time to stay healthy and minimize boredom. 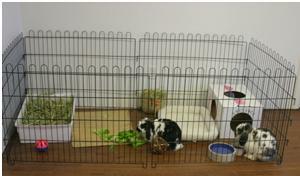 A rabbit's living space should be out of direct sunlight and in a place where s/he can have some quiet time and feel safe. 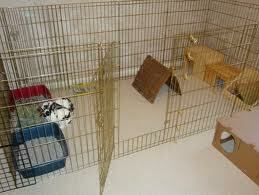 Even free-roaming rabbits need a place to call their own, for their peace of mind and yours. 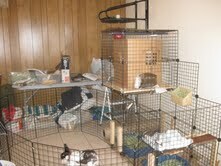 Creatures of habit, they need to know where to go for their food, water and litter box. 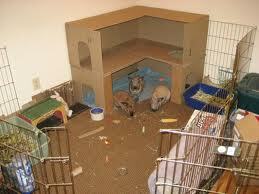 Rabbits enjoy a place to hide, whether it is a willow tent, cardboard box or tube. 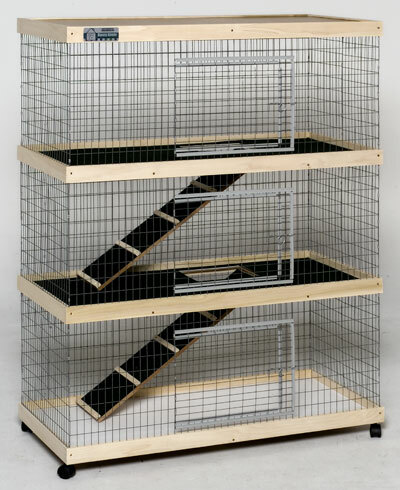 Pet store cages are too tiny and have wire floors. 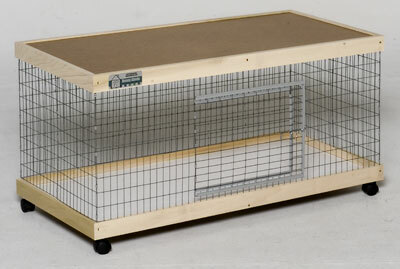 Unlike cats or dogs, rabbits have no pads on their feet in which wire flooring can cause sore hocks (ulcers). 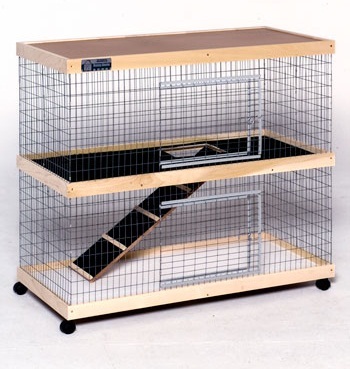 When shopping for a litter box in a pet store, forget the rabbit aisle and head to the cat aisle for litter pans. 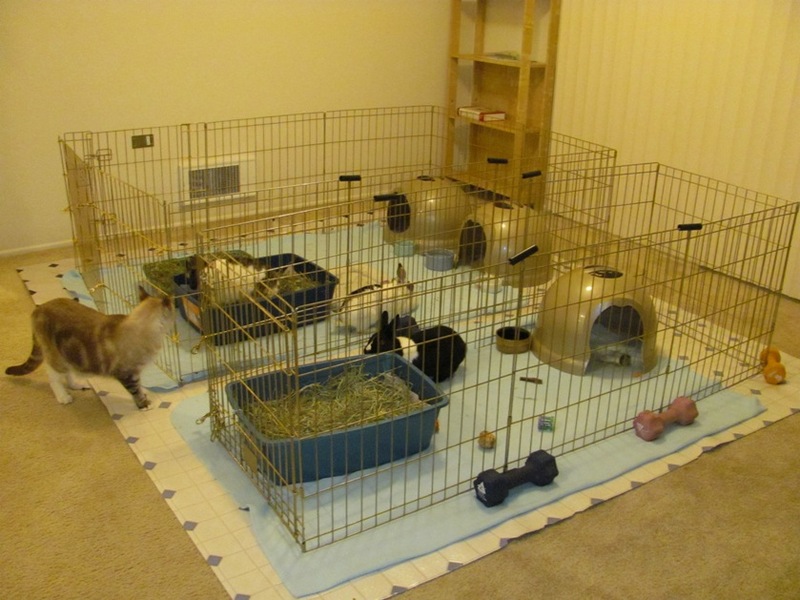 Bunny litter pans, like bunny cages, are almost always too small. Some rabbits are "free roaming." An untrained rabbit needs supervision when you're not there to monitor. 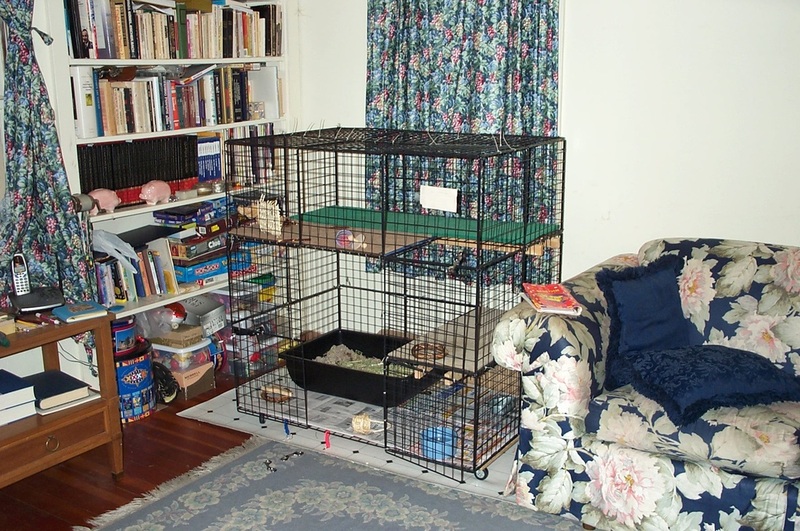 However, once your rabbit is well litter trained, and your house or an area of it is fully bunny proofed, your rabbit can be allowed free run of the home (or part of it), even when you're not there. 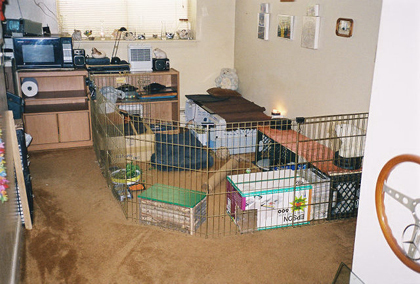 The more room your rabbit has to run around, the more a part of your family s/he becomes, and will reward you with funny antics and be a better companion. These organizers/cubes can be found at Bed Bath and Beyond. Target has similar cubes; however, they contain larger spaced squares which may pose a danger for baby or smaller sized buns. The electrical ties or "tie wraps" are from Home Depot or Lowe's and they keep the frame together. 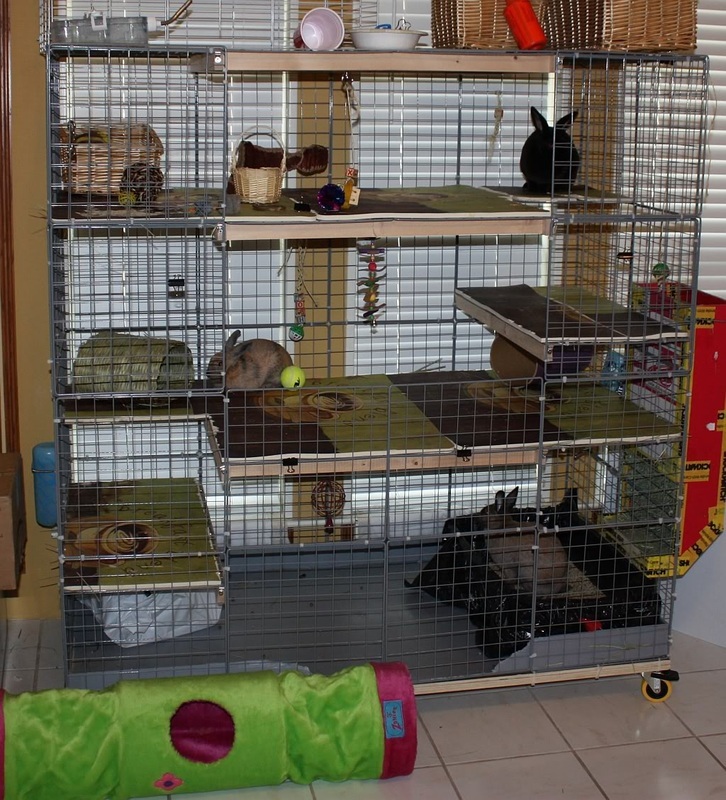 Outdoor mats, flooring samples of linoleum or carpet (low and tight woven, such as berber to prevent ingestion) work well for the shelves/upper levels and floor. 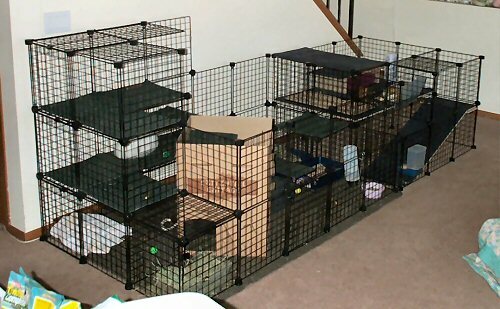 Feel free to email us for instructions for a basic NIC condo. 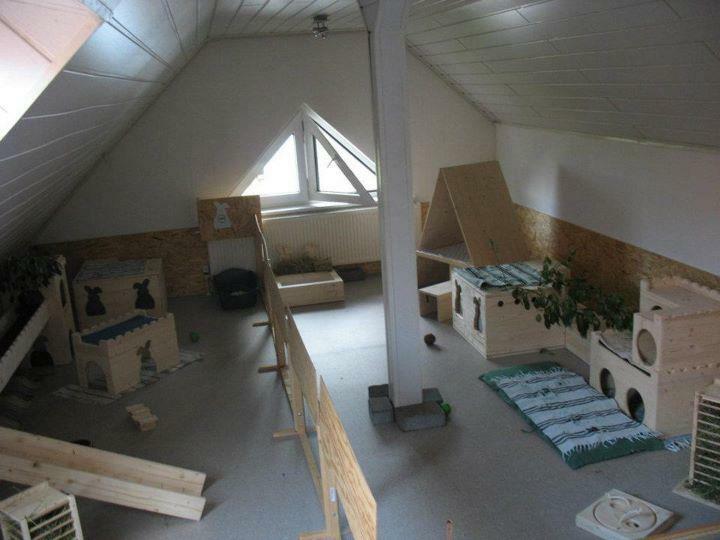 Cons: can be pricey, extra tall pen is needed if the rabbit is a "jumper"
These condos can be purchased on their website here. 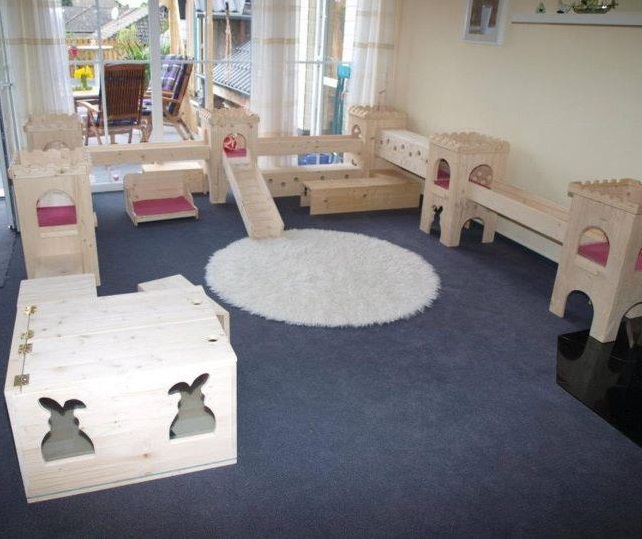 The company that makes these items is in Germany and their website can be found here. The website is translatable from German to English when using Google. Please note that we have NOT had any experience with this company, so we cannot attest to any reputability, safety, construction, etc. 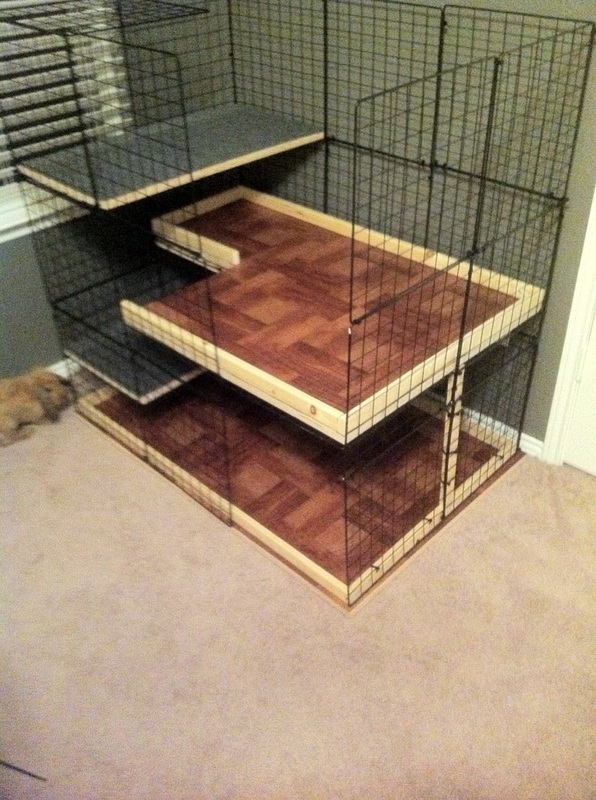 but wanted to apprise rabbit owners of what is available for fun ideas. Also, The Blissful Bunny, based in the U.S., also makes items similar to those shown in the picture. Proceeds benefit rabbit rescue groups around the country.